Set in the township of Ngukurr, a remote Aboriginal town in south-east Arnhem Land, Northern Territory, Stone Country follows the stories of several residents – from the local DJ to respected community elders. Through these stories, we come face to face with the realities of life for Aboriginal Australians: a life expectancy 20 years less than other Australians, and often inadequate access to housing, roads and hospitals. Mark Anderson was invited to Ngukurr to film a documentary about life in the community, and to speak with the locals about their growing concerns for their community. Mark also visited a senior Nunggubuyu elder and traditional caretaker of Ngukurr land. The elder spoke to Mark about the hardships his people have come to face, and asked him to bring awareness to the issues that Ngukurr, and many other Indigenous communities, currently face. 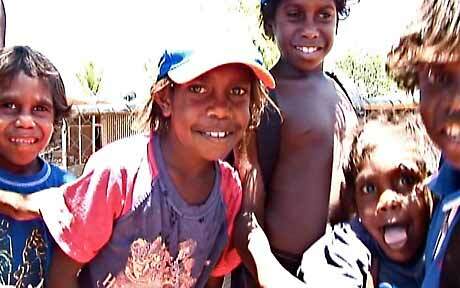 The Indigenous people of Ngukurr are living significantly below the poverty line. Their remoteness sees them in short supply of fresh produce and their early mortality rates are often due to diseases related to poor nutrition. In some instances there are up to 30 people living together in 3 bedroom homes with poor standard of living facilities and conditions. Still image from Stone Country. Image courtesy Budaya Productions.